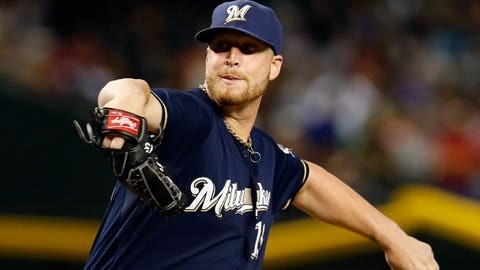 Brewers relief pitcher Will Smith is part of a bullpen that has one of baseball's best strikeout rates. The Milwaukee Brewers begin a three-game series against the Philadelphia Phillies at Miller Park on Friday and, despite the latter having the worst record in baseball at 46-69, it may not be a cakewalk. Philadelphia has been playing exceptionally well over the past month, going 17-7 so far in the second half. After owning MLB’s worst record before the All-Star break, the Phillies are attempting to become just the 11th team in history to post a .500 or better winning percentage the rest of the way. At their current pace, they’d have the best post-break record among those teams. One of the main reasons for that success has been the Phillies’ resilience, not typically a trait of a last-place team. They’ve trailed at some point in 10 of those 17 wins, which is the most comeback victories in the majors since the All-Star Break. The Brewers, meanwhile, are coming off a sweep against the Chicago Cubs and have just two more wins this season than the Phillies. But don’t blame the improved pitching staff, which is holding opponents to a .704 OPS since the All-Star break, one of the best marks in baseball during that time. Philadelphia, too, has seen an improvement by its pitchers in the second half. Milwaukee’s bullpen, which has been a strength all year, has gotten even better — at least in terms of whiffs. Brewers relievers have an MLB-best 28.4 percent strikeout rate since the All-Star break, as Will Smith, Michael Blazek, Neal Cotts, Jeremy Jeffress, Francisco Rodriguez and others pile up the Ks. The Brewers will need their bullpen to get plenty of strikeouts because the Phillies have shown they’ve got no problem coming back late to win games.